We are having a warm fall, and I found two caterpillars late in October. 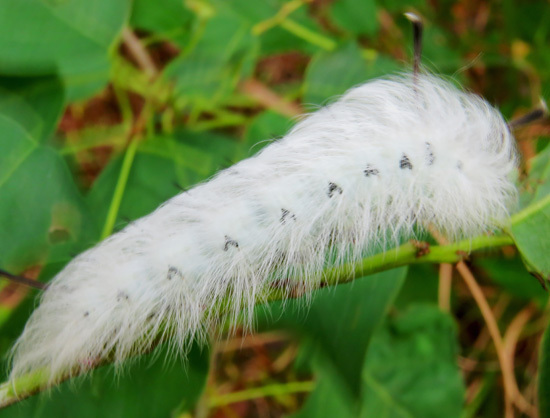 I was excited to find this caterpillar munching on one of our invasive trees, the Chinese tallow. If I could find anything that would eat them up, I would get a Nobel prize. I believe it is a Spotted Apatelodes, Apatelodes torrefacta. Sadly, it eats a large variety of foliage, so no one will be awarding me anything for my discovery. It was so cute and fuzzy, but I didn’t touch it in case those were stinging hairs. 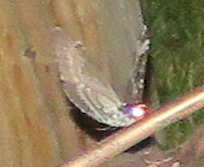 When in moth form, its brown wings are held away from their bodies and look like they are missing huge chunks. I found this next one when I was out looking for spiders in the dark. 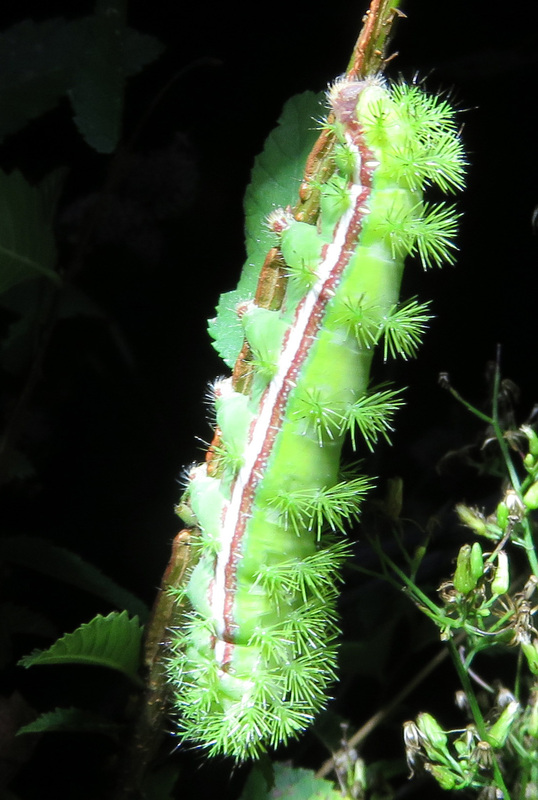 Io moth caterpillar, Automeris io, munching on an elm sapling in late October. 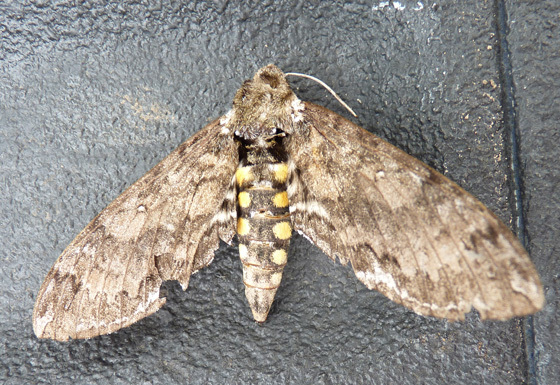 I have had its grown-up counterpart in the house one time — it is a beautiful large yellow and rose-colored moth, but that one was too battered to look decent in pictures. 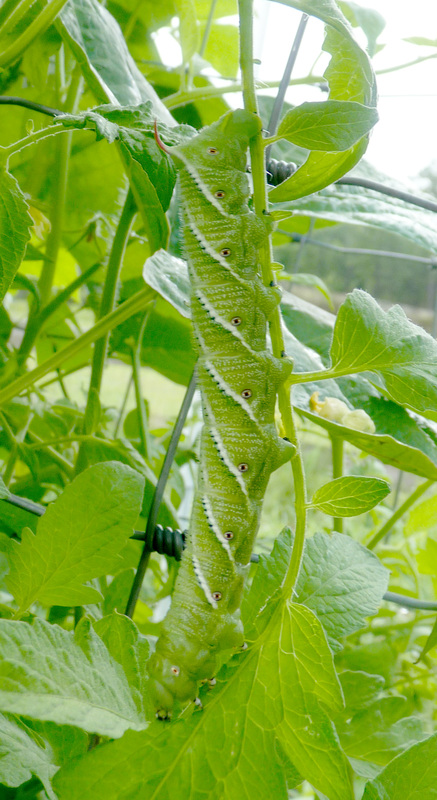 I thought this next one was a Tomato Hornworm, since it was on our tomato plants. 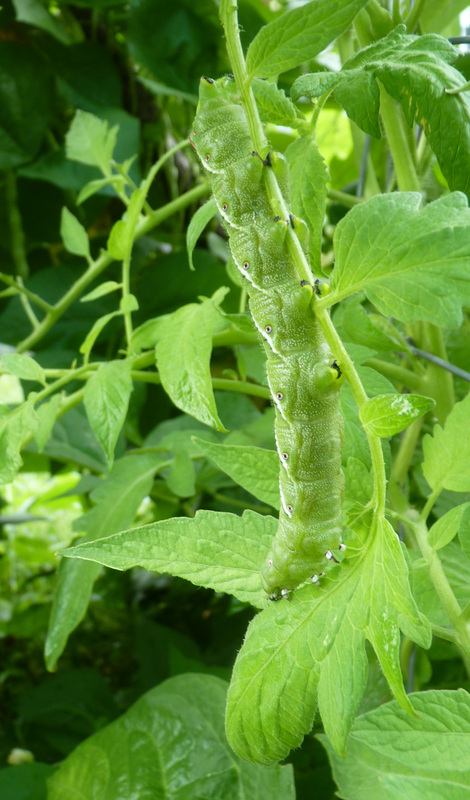 I have since learned that is in fact a Tobacco Hornworm, but that both of those species can be found on both plants, and on potato plants as well. Tobacco Hornworms, Manduca sexta, have seven diagonal white stripes and a red or orange “horn”; Tomato Hornworms have eight V-shaped stripes that go over and under the little dark dots on the body, and their “horn” is blue-black. Tobacco Hornworm or Carolina Sphinx, Manduca Sexta. 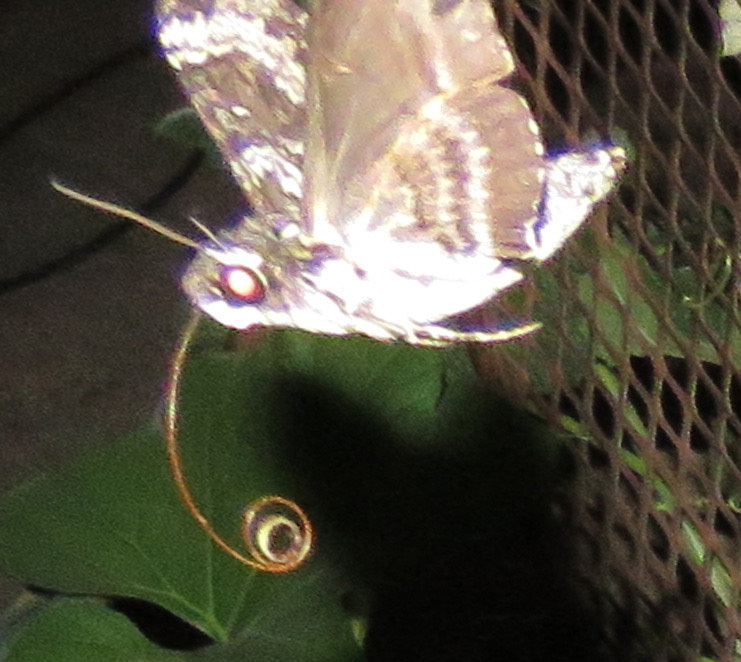 Here it is on a tomato plant. 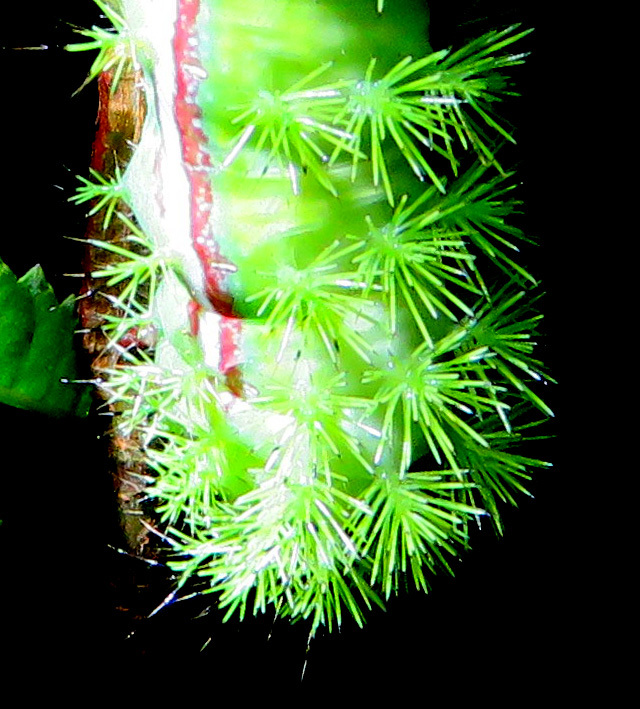 This picture is blurry but the curved reddish horn on the end of the caterpillar is visible. 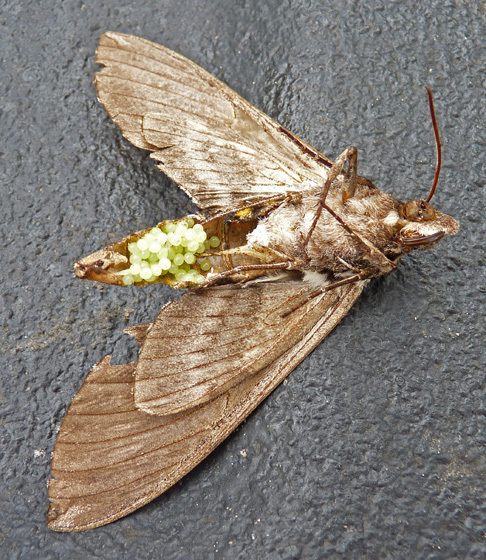 Here’s what it looks like as an adult —Manduca sexta or Carolina Sphinx Moth. This one was dead in the driveway when I found it. When I turned it over, I saw it was full of eggs. 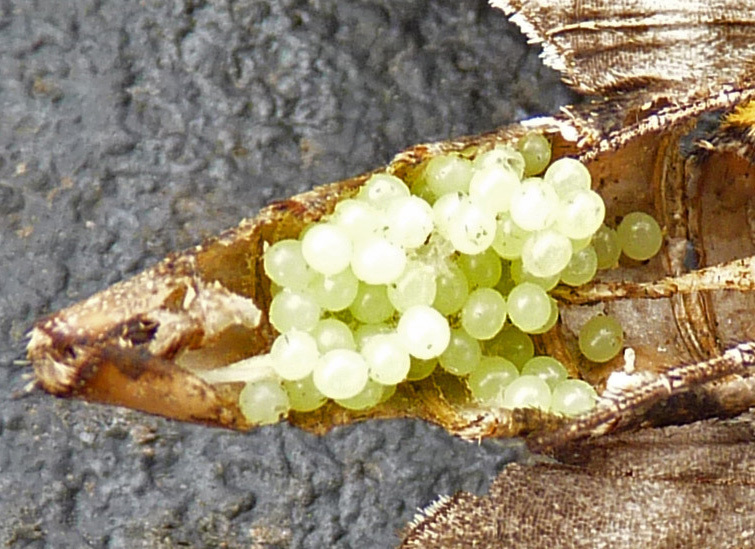 Close-up of the eggs. Someone at BugGuide.net suggested I should try to hatch them out, but that never occurred to me. I will remember it if I ever find more. 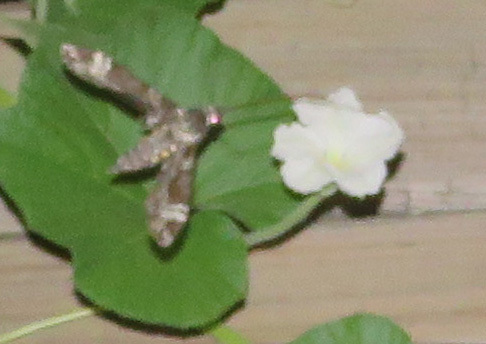 From seeing this dead specimen, I could identify the moth I had photographed one night in late September of 2015. 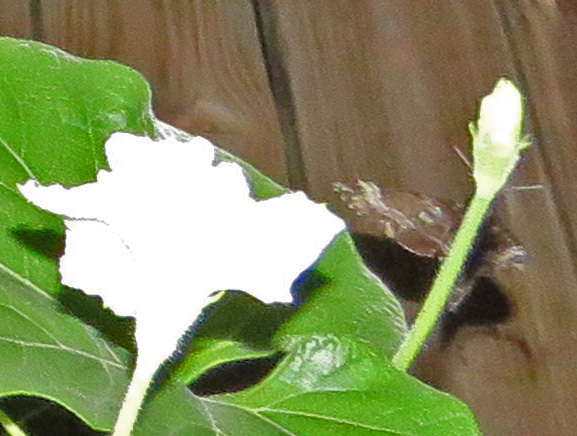 I believe it is pollinating my birdhouse gourd plants, and that solves a mystery in itself! I have very good luck with the gourds forming but I had read that a lot of people don’t. I was curious about their pollinators, but all the online references I found said that no one knew what pollinated them. I am a very lazy gardener and don’t patrol for hornworms, so if they get to adult stage and then pollinate the gourd blooms, that would explain why I have success, and other, more proactive, gardeners don’t.